You've fought the battle for hours. Your team is down to one man. You flee. The enemy pursues. you're pinned, about to be struck down, when reinforcements arrive! They throw the enemy off and save you, just in time, but ... where did they get those tights? The Men of Sherwood: In short, the Cavalry. 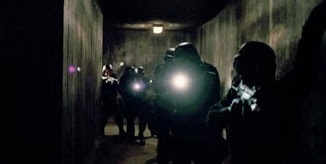 This strategy trope consists of a large group of often nameless characters (with a few recognizable faces in their midst) who rush in to save the protagonist, usually with little to no casualties. Their numbers alone make the enemy flee in terror. They may or may not wear tights. Not to be confused with The Red Shirt Army, the exact opposite. Sometimes a hero can't do it all on his own. Just ask Paul from Dune. 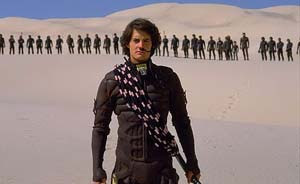 Not only did he find a bunch of desert people to help him overthrow the floating fat man - a pack of giant worms came to help, too! "This is it - back me up guys ... Guys?" Now, the Men of Sherwood may not always be on the hero's side, but they have sense enough to rush in and take care of any loose ends. "Forget about Batman - save those hostages!" 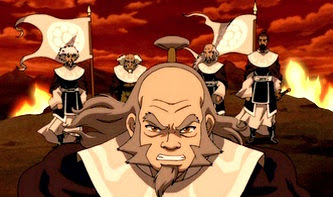 And how about The Order of the White Lotus? Who said a bunch of old guys can't pitch in to help bring an end to the Fire Lord's rule? "They may take our Air, but they will never take our Fire!" The Men of Sherwood don't have to be people in hiding or living in the woods. Any military force or a mob of angry villagers will do, but they have to make a sweeping victory with little to no losses. It's also helpful if you foreshadow this saving grace for maximum effect. When have The Men of Sherwood appeared in your story? Where else have you seen this trope used. Do you think tights are required? Does a fleet of Cosbolts count? I'm sure in some of my older more military-themed stories I've used this. So you were willing to put on a dress but not green tights? For shame! Where's your dedication?? Anyway, it might not count, but one of my favorites were the three green aliens at the end of Toy Story 3. Nope. Never used this one. Lord of the Rings has a few of those, doesn't it? Um. Well the tights make it interesting :p.
My calvary came in the form of an unnoticed but very accomplished friend of the MC. Whack a Mole time. I definitely prefer my Men of Sherwood in tights. Only way to go in my mind. I like the men of sherwood trope. And it's not like it doesn't happen in real life. I'm sure that the people suffering at the hands of the Nazis felt great relief knowing that "the allies" were on their way back in the forties. I guess that's the ultimate "Men of Sherwood" for a real life story that brought justice to a horrific totalitarian regime. Ah, the Order of the White Lotus. We were all cheering when they appeared. Must watch Nickelodeon's Avatar again. Tights are always required! Unless it's the White Lotus. That would be creepy. Man, I love Avatar. I've never used this though. I just watched Clue and I couldn't help thinking of the end when all of the FBI rushes into the mansion... definitely lots of men of Sherwood in that scene! YAY for the Avatar reference. LOVE that show! I've never used this particular strategy for getting my hero out of a tight spot, but I might eventually. And when I do, they will definitely be wearing tights!! The Great Hunt has one. Enjoyed this post. No men in tights in my stories. But after this post, I may have to reconsider. No, tights are not required, but certainly permitted. Also permitted anywhere are images of Kyle MacLachlan from Dune wearing something form-fitting with a purposeful and brooding expression. Regular pants will do for me thank you, but, yes, I think a righteous mob can be far more effective and believable than a lone musketeer playing superhero. Avatar is an awesome show! Sorry, but I wish to point out one thing (it also appeared in the comments) - I believe you mean Cavalry, not Calvary? As for hordes of good guys appearing to save the day, I suppose it's far more reasonable than a Chuck Norris type taking on 20 guys without breaking a sweat. I don't know if tights are required . . . but they are a plus for sure:-) Great post! Oh those men in tights who show up at just the right moment--you gotta love 'em. Or hate 'em. Depending on whose side you're on. Huzzah for the Avatar reference! OMG, I am hiding my face in shame. YES, I had the Men of Sherwood come save my protagonists in my last manuscript (except they were descendants of Morgan Le Fay and led by a hot college chick, but that's another story). 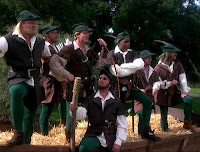 And, just by coincidence, my husband and I had an argument last night over whether to show our daughters Robin Hood, King of Thieves, with Kevin Costner or Robin Hood, Men in Tights. I argued that they couldn't fully appreciate the spoof without seeing the movie that was being spoofed. Love this. Boy Scouts work. I'll admit, LOTR was my first thought. mine are evil trolls! and evil harpies! evil lurks in the woods!